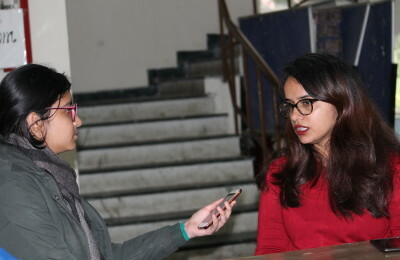 Our conversation with Rene Sharanya Verma, a student of History at St. Stephen’s College, slam poet and feminist rapper, and one of the five Indian recipients of the prestigious Rhodes scholarship, reveals her expectations and plans for the future. Q. How does it feel to have secured one of the most prestigious scholarships offered to Indian students by a foreign university? Rene: It’s quite surreal, really! I’m humbled and honoured to be joining a cohort of eighty-eight other inspiring and inspired individuals around the world who are working in profound ways to create a better future through the fields of advocacy, gender relations, policy formulation, ethics, and healthcare. More than anything, availing of the privilege to study at a premier institution like Oxford reaffirms my commitment to using my voice and work to contribute to larger cultural and political conversations across the world. Q. What course have you chosen to study at Oxford and what is your particular interest in this subject? How does it compare with similar courses at other institutions? Rene: I intend to pursue two Masters of Studies (MSt) programs in Women’s Studies and Film Aesthetics. Ultimately, I aim to work on feminist film theory, engaging with how filmic elements like playback music, colour, light shape and are shaped by the performance of gender. Additionally, I am interested in addressing notions of spectatorship in the context of Indian cinema. I also hope to create films, both fictive and ethnographic, which combine my love for spoken word art, narrative cinema, humor as a site for politics and advocacy. Both programs offer an interesting blend of interdisciplinary engagement along with specificity of the course modules provided. They focus on research methodology and theory, have small batches of students, and the thrust is on original research through one-on-one mentoring and tutoring. More exciting however, is the provision of opportunities to work with the Oxford International Women’s Festival, the Women in the Humanities programme, and the International Gender Studies Centre. This provides a great chance for young scholars in the academy to engage with grassroots activism and the possibilities and challenges of transnational feminism. Q. Most students are apprehensive about the daunting application process that is involved in applying to foreign universities. How was your experience? Rene: I spent my second year hoping for the best and preparing for the worst. I can vouch for the fact that application processes seem much more daunting than they actually are, especially if one paces themselves and is cognizant of deadlines. The process of applying to Rhodes is quite straightforward, and in distinction to other scholarship applications, begins quite early. I was able to zero in on my course combinations towards the end of my second year in college, and worked on my application during my summer study, which was beneficial. One of the great things about the Rhodes scholarship is the amount of support you receive from the Rhodes Trust in assisting and streamlining the application process to the University, with reference to English language requirements, connecting with scholars from previous years and same courses/colleges. All in all, my experience has been very rewarding and relatively stress-free, so I’m quite relieved! Q. What would be your advice to students applying abroad regarding statements of purpose and letters of recommendation? Rene: The personal statement for the scholarship is a thousand word essay designed to present a concise version of one’s goals, aspirations, and by extension, who one really is. It can seem challenging at first, but I would highly recommend that candidates begin by thinking about the differences between an academic statement of purpose, a personal statement and a resume. It might ease one into thinking about how to approach the personal statement in a sui generis way- there is no right or wrong personal statement. I think the best way to go ahead is to present cogently and simply the arguments, questions, ideas, experiences that best define you. For instance, my statement revolved around silence, interweaving personal anecdotes with my academic proclivities and aims. For the letters of recommendation, it would be prudent to approach professors, mentors and teachers who have encouraged your work through supervision, tutoring, discussion and are well aware of your strengths and weaknesses. I think that extends to certificates vouching for good conduct and extra-curricular activities. It’s crucial to notify your references well in advance, keeping in mind their work schedules and other commitments. It is always helpful to provide referees with an idea of your proposed area of study, a resume and transcripts or other relevant documents. Q. How was your experience at the interview? On a scale of 1 to 10, 10 being the highest, how nervous were you? Rene: My interview experience was quite wonderful! I did experience jitters (which would ring in at a very strong 6) prior to the interview, but luckily, the committee organized a dinner with the interview panel a night prior to our final interviews. We got to interact with the panellists, distinguished scholars, professionals, and Rhodes scholars from previous years– who were kind, jocular and very accommodating. The setup also ensured that we got to interact with our peers, which was one of the most rewarding takeaways from the experience, as some of us formed great friendships. The interview itself was refreshing and thought-provoking. It never seemed like an interrogation, and was an engagement where I was given a lot of space to articulate my beliefs and politics, research interests and achievements. The panel was not intimidating, au contraire, the panellists were very responsive to my answers and even shared a few jokes! Q. What, according to you, was the most instrumental factor that led you to achieve the scholarship? Rene: One thing that I’ve learnt is that there is no one type of Rhodes Scholar, and indeed, therein lies the beauty of the scholarship. I’d like to believe that one of the most instrumental factors that aided me was that I tried to be as honest about my beliefs as possible- to the interview panels, selection committee and most importantly to myself. I reckon my interests, both academic and extra-curricular, ranging from film-making, screenwriting, theater, spoken-word poetry demonstrated a singularity of purpose, and an unequivocal avowal to ideas I am passionate about. Q. Do you have any apprehensions about moving so far away from home? Rene: I have lived away from home prior to this, but never for so long. I’m going to miss the little things- hugging my family in vivo, eating in North Campus, walking in the Lodhi gardens. Living alone has also made me check my privilege and be grateful for things I took for granted—like household chores, food, and the presence of loved ones. Most importantly, I’m quite nervous about the weather, but I hope to bask in the ever-elusive sun as long as possible! Q. What are you looking forward to at Oxford? Any expectations? Rene: I’m looking forward to using two years of my life to expand my horizons, meet new people, travel on a budget, and create some meaningful work. I am excited to join a vast community of intellectuals, engage with a multitude of ideas, and forge lasting friendships. I’m delighted to be connecting with advocates for gender equality from across the world, fellow poets and writers and I hope to work with theatre, sketch comedy and film clubs while I’m there!